Sensomatic, was incepted in the year 2004 at Phursungi, Maharashtra, to manufacture, export, wholesale, retail, trade the best Quality transducers at competitive rates in India and to eliminate the threat of sub-standard imported products which are imported from other Asian countries. These Products were Developed to work in the Harch Industrial Application of Tropical Countries. 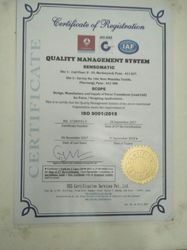 We are the only Indian manufacturer to offer Replacement Warranty (for certain range of products) & extended Warranty. We have a well-equipped service center with calibration facility to service all reputed international brands at our Phursungi Unit. Within a short span of time, we were able to establish Sensomatic as the Best Brand through our Channel Partner M/s. Sensotech, in most of the Industrials sector. We also develop & manufacture custom built products for varies industries, as per the customer specification. Sensomatic offers a wide range of load cells for various Industry Specific Application with Unique Geometry & configuration. We manufacture High Precision Transducers for Medical, Health, Food & Beverage, Pharmaceutical, Aerospace, Marine, Aviation, Military, Automobile, Rail-Road-weighing Scale, Retail, Construction, Chemical, Oil & Gas, Mines & Collieries, R & D, SPM & UTM Machines, on Board Weighing System. We follow the best industrial practices, benchmarked with world-renowned manufacturers in this field in terms of Quality, Consistency, Timely Delivery and Customer satisfaction. Our Lean manufacturing practices ensure that the Products are competitively priced. Our Focus on core Products for Industry specific application has given us to greater flexibility and adaptability to manufacture a wide range of products in accordance with the requirements and specifications of the clients as per International Standards. We are proud to state that within a short span of time, we have achieved the distinction of being the most reliable partner for many of our OEM's in India & Asia Pacific Region. We Manufacture a wide range of High Precision Load cells for Various Industrial Application. Our Range includes S Type Load Cell, Rail Sensors, Health Care Sensor, Shear Pin Load Cell and many more. The wide array of products is made using optimum quality raw materials such as steel sheets, iron sheets, brass, alloys, and metal components in accordance with industry standards. We are managed by a team of dedicated and experienced professionals who are committed to achieve the organizational goal, by offering quality product to our clients. Our team comprises Engineers, Quality experts, Technicians, R & D experts, Sales & marketing executives, Management & administration professionals and Store keepers. These personnel are hired on the basis of their skills, ability and expertise in their operation area. Our team members keep themselves abreast with industry standards and capable of meeting the individual requirement of clients. Due to their hardwork and essential efforts, we have established cordial relationship with our esteemed clients.